I am a soup and sandwich person any sugestions on sandwiches that would go well with this soup? I think a panini would be great! I have a bunch of them here, maybe the chicken chipotle! for the liquid i am going to use half almond milk and half vegetable broth 😀 sounds yummy can't wait to have some for lunch! Thank you for this wonderful recipe! I cannot have dairy but LOVE thick soup – this totally fit the bill. I just used the white mushrooms (since I had those) and I think I would add a little garlic powder and pepper next time, but it was delicious and so satisfying! My 14 year old loved it too! That looks good thanks for sharing. I'm thinking some skinned potatoes would be good in it as well. first thing Ive made from this site that I was unsuccessful. Could not be salvaged. Maybe it was the mushrooms? I love the MMMMMmmmm in the spoon. I feel like i found the hidden word. oh my so happy to see this recipe, i cant wait to try it. sounds wonderful now that fall is here. all your recipes ive tried have been amazing even the ones i havent tried either look or sound great. you should honestly come out with a cookbook!!!!!!!!!!!!!! Hi Gina – love your site and make your recipes ALL the time! This is a non-recipe related questions – I love the bowls!! Where did you get them! I knew I bought those mushrooms for a reason! Looks easy and delicious! And quite healthy! Your site is saved on my bookmark bar! I have beef broth at home, do you think this would work with that or should i buy the chicken? It will change the taste, but I'm sure it will still taste good! I love soups… This what light food should be about, If I eat a salad I don't feel like I ate anything, but when I eat a soup no matter how light it is I feel fulfilled.. I just copied it. My husband and I are back on the Program again after a month in Germany eating way toooo much. I have never made this without cream, but will try the chicken broth suggestion. Thanks for a good and helpful blog for people like me. You're English is fine. They are also known as Cremini mushrooms, or you can use white mushrooms or whatever is available in Spain. I have been making this soup since your first post and I LOVE it as I do ALL of your recipes. I always make a double batch. I'm so excited that it's soup weather again. Thank-you for all you do for me/us. You have been such a God send. When you call for 5oz of shiitake mushrooms, are you referring to dry shitake mushrooms or reconstituted? Dry are almost $5/oz, so all of a sudden these dishes get pricey if dry is what you are referring to. No, I always buy them fresh. As pictured above in the photo. In addition to Gina's answer — if you want dry mushrooms to keep around the house, Costco's are only $10 for a HUGE container. Yes, that but use half of the amount. Gina – to make this gluten free would I swap out the flour and use cornstarch? This is purely to thicken the soup correct? Use low sodium chicken or mushroom broth instead. OMG! I just made this. LOVE LOVE LOVE!!! This was so quick and simple to make. I will definitely be making this frequently. Wow! Thank you! Do you have any recommendations for substituting out the bouillon cubes for something more natural with less sodium content? Thanks! I made this soup tonight along with the Turkey Stuffed Zucchini. Both were so yummy! I topped the soup with a dollop of fat free sour cream and a sprinkling of parsley. I so love this soup! Thanks Gina for all the great recipes. I love all the ones that I have tried (which is a lot of them) and so does my husband. You have really helped with my weight loss journey with WW. THANK YOU SO MUCH!! Gina…This soup is delicious! I made last night for an appetizer and was floored. I could not believe how rich and savory it was with only the little bit of butter and flour. I will be making this again and again and again. THANK YOU!!!! I have been a lurker to the site for a long time and love your recipes Gina! It has answered my prayer of cooking healthy for my family while maintaining taste. I try a different soup every week and that is the main part of my lunch. I have to say this soup is great! At the end I used a strainer to get the soup in a bowl without most of the mushrooms. I then used my hand blender to thicken the soup. I blended the celery, a few mushrooms and added 1 russet potato to thicken it up. I also took another users advice and added salt, pepper, onion and garlic powder to flavor it while simmering. I only allowed to simmer for about 10 minutes. To those who are coming out with watery soup, simmer with the cover off. I added a touch of salt & pepper, used real butter (just less than what was called for), and a splash (approx. 1tbsp) of dry sherry. This recipe is delicious, simple, and versatile. It's just plain good. The only good thing you can say about this soup is that it is low-fat. What a waste of time & money! This soup is not creamy or velvety–it's not even white! It's watery & brown; it looked like dirty dishwater! It is also in dire need of some salt! I had to add extra flour, cornstarch, & salt to make it palatable so it wouldn't be a complete waste. I followed the recipe exactly. I don't understand the good reviews! This soup was AWESOME. I added a little garlic and onion powder and it was perfect!! Thanks for all your great recipes!! 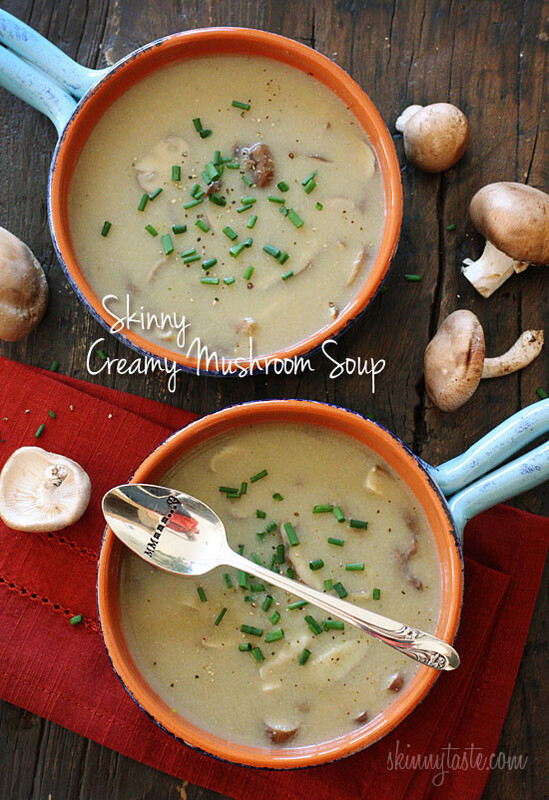 I made this the other night – I wasn't so sure how a healthy mushroom soup would taste, but it was SOO good AND EASY! I used chicken stock and regular mushroom instead of baby bellas b/c that's what I had. Had some dehydrated shitakes – just soaked/boiled them & then added some of the water it soaked in. And I blended most of the shitakes. My boyfriend and I both LOVED it (I still can't believe how easy it was)! I can't wait to make all your other soups and recipes! Thank you! This came out a little watery and only after it had sat cooling for a couple of hours did it become thick. Next time I'll make it a few hours before mealtime. Thanks Gina for another great recipe! Great! I grew up having a bowl of soup before dinner, I guess my parents had the right idea. Oh my, I just made this soup. It was delicious! Gina, you never disappoint! As a garlic lover, I put a little garlic powder as an afterthought. I wonder if it would be good with a clove or two boiled right along with the rest of it and then pureed. I think I will try that next time. These low point soup recipes are really helping me. I have been enjoying a bowl of soup before both lunch and dinner and I really feel full, but the pounds are still coming off. Awesome! I made this last night along with your baked onion rings, both were so delicious! I didn't blend the celery, just discarded, my soup was so rich and creamy without it so I didn't bother! This will be a staple for me for sure, its so easy to make! I made this tonight. I used I Can't Beleive it's Not Butter spray. I also used 2 3.5 oz containers of Shitake mushrooms (I was too lazy to measure out). I blended more than a cup of the soup because my mushrooms were so big. My soup was very brown, not light like yours, but it was still good. My non dieting teenager loves this! I made this for some non-dieting friends and they loved it! So simple and so incredibly rich it's hard to believe there's no cream involved. Thanks for sharing this with us all!!!! I made this for dinner tonight and my family loved it. I used the celery but also added a carrot stick, some onion, and a clove of garlic. After they were soft, I used my food processor with a cup of the broth and added it back into the soup. This is so delicious, and is definitely on the make again list! Thanks for the recipe! This was delicious!! I used fat free soup instead of water and when I blended celery I also blended some of the mushrooms…this added extra thickness. I want to thank you for your creative awesome recipes. I'm a foodie and love to cook. Finding your website has made my WW experience so much more enjoyable. Keep up the great work and know you are helping others achieve their weight goal painlessly. I only had a handful of shitake mushrooms, so I added some diced (and later mashed) potatoes in order to add some thickness. I'm also on a goat cheese kick, so I sprinkled some on top for a bit of tangy-ness. It was yummy! Gina, I can't tell you how much I love your site! I have been in WW for 6 months and have lost a stone with the help of your recipes and have loved every single one I've tried. Thank you so much! I LOVED THIS!! I used 4 cups of the actual broth (box-low sodium kind) and just a box of (8 oz) of mushrooms – nothing fancy. As I blended it in the blender after the simmering, I added 1/2 c FF MILK……and also used LIGHT BUTTER so I could add more….WOW!! WAS IT YUMMY!!! Thanks Gina……this is in my favorites on my e-tools! I am loving it! Made this last week, added salt, pepper, garlic and onion powder. Very good and so easy to make. Will definitely make again. Yes, that must be what happened, the longer it simmers, the more it evaporates. Adding a little more water will fix that if that happens. Gina this soup is amazing! One thing though…I carefully measured my servings and only had enough to make 3 servings…perhaps I simmered it on the stove too long??? I let it go on low for quite a bit while doing other things in the kitchen. If people knew how simple it was to make your own great tasting soup from scratch, would they still buy it in a can? I never buy canned soups, it's so easy to whip up a soup with whatever veggies you have on hand. I made this last night and it was great. Even my boyfriend who is not a fan of mushrooms really enjoyed it. I just made this – and am frankly shocked how YUMMY it is, considering how simple it was – and how few ingredients. Delicious! Thanks! 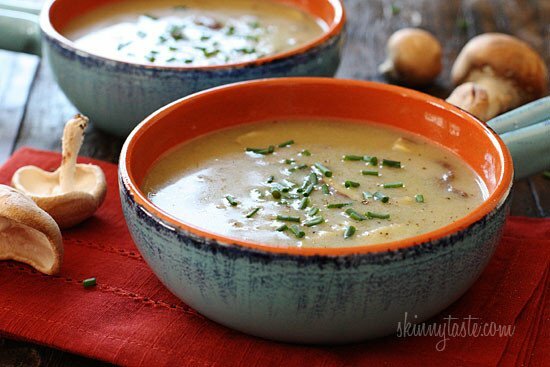 i cannot wait to make this soup for tonight, it will be perfect for these chilly days! I made this delectable soup for lunch today and LOVED it! In fact, I ate the entire portion throughout this afternoon because it was so good. Gina, I can't tell you how much I love your site! I have been enthusiastically experimenting with so many of your recipes and have loved every single one I've tried. Thank you! Do you think this would freeze good? I am trying to pre-make my lunches while I am on winter break so when I go back to school I have food everyday. Gina do you think you can freeze this soup!! I love it and would like to make a big batch of it! I love mushroom soup on cold winter days! I often use a mixture of oyster and shiitake mushrooms in my homemade soups. I find the velvety texture of the oyster mushrooms complements the cream very well. Thanks for sharing! Rosemary- I think it would be fine to leave them in. The flavor would not be the same if you left them out. Ahh! This is very perfect for the season. A creamy bowl of cream of mushroom can certainly make my day! hi gina! how well does this keep? i was thinking of making some for lunches this week but i'm worried about the mushrooms getting soggy. what do you think? could i leave the mushrooms out and adding them to the rest on the day i want to eat it? Amazing how combining a few ingredients can taste so good. I'm happy you all enjoyed it! I threw out the celery because it's not my favorite! If you put more then 1 cup in the blender you can thicken it up just a bit. I also added thyme. 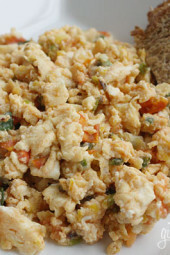 It is very good, I served it to guests and they loved it! Great website Gina, you are very talented. This, like all of your recipes looks YUM!! Thanks so much for all you do, the recipes, the point calculations, the pictures etc, etc, etc….. I am going to try this tonight! 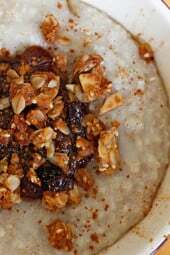 I happened upon this website one day and I think you are fabulous for sharing your wonderful recipies! Thank you so much ~ you are definitely making it easier for me and many others to continue a healthier lifestyle!! This was very good and easy to make!! I like the mushroom dishes very much.It was very good. WOO-HOO! I just bought a ton of mushrooms and now I know what to do with them! Chicken broth instead is perfectly fine. Sorry to confuse anyone, yes, instead of discarding the celery, I like to puree it which helps in thickening the soup. Or, you can simply throw it out if you don't feel like dirtying a blender. It will still be yummy. It was very good, and even my picky daughter loved it. I'm sure you will agree. And it's so simple to make. Enjoy all! Dee, I think you blend the celery with a cup of soup then return it to the pot. 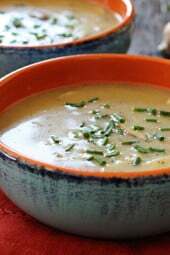 Yum, I love creamy mushroom soups! This looks great! I'm wondering the same thing about the "Remove celery and a cup of soup in the blender, then return back to the pot" – didn't see a reply to this question? this looks GREAT! I can not thank you enuf for all these fantastic recipes! This has helped me tremendously to stay OP! THANK YOU!!! Can I use 4 cups of chicken broth instead of water? Looks yummy! Gina…thanks for all you recipes! Love your website and have made several dishes and loved them all. Also thanks for re-calculating the Points+. Baby bellas are mushrooms, you could use white mushrooms instead. Points don't change if you use fat free chicken broth. You have "baby bella" in the list of ingredients but don't say where to add it in the instructions. I'm not familiar with Baby Bella, is this baby bell cheese or something else? Love your recipies by the way! Look delish! Question – how much would the points change if I used low sodium chicken stock instead of water & bullion? Mmmm. This looks wonderful. I think I'll make it tonight! One question….just to be clear, you remove the celery and 1 cup of soup, blend it in the blender, then pour it back into the pot? I'm not sure if it's just me… but the last part of the Recipe seems to be incomplete? I don't understand the last sentance? "Remove celery and a cup of soup in the blender, then return back to the pot." 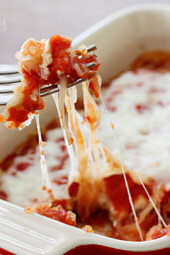 I can't wait to make this… I have been searching for a recipe like this! Celery and a cup of soup go in the blender, then back into the pot. I was also confused by those directions. Does this mean that the stalk of celery is put into the soup 'whole' (instead of the usual 'chopped or diced') and then removed and blended? I was confused by this too, but it seems that you are supposed to chop up the celery – I'm going to assume in half or at least large slices – and puree it in the blender with the purpose of making the soup more thick. The reason it's a bit unclear is because we aren't sure WHY we are blending the celery. Also for how long do you put it back in the pot after the blender? This recipe looks delicious but the last bit is unclear. It is awesome that you are calculating for the new points plus. I am so happy. I love your site and you do a marvelous job giving us the best tasting food for low points values. Thank you for being SO considerate to those of us who follow you and W.W.
Hey Gina! I am so excited to see this recipe. I live near the mushroom capital of the country so there's always good mushroom soup around but obviously it is so high in calories/fat! I was thinking about you and the WW transition. What do you think so far? I'm loving it! Can I get an updated pointsplus value for the stuffed shells? Yum; this looks delicious! Will put it in the rotation for next week's menu plan! You might want to take a look at Prevention RD: http://www.preventionrd.com/. She posts a lot of diabetic-friendly recipes and also answers questions. If you scroll down a bit and look on the right side of the page, you can see her recipe tags; click on the one that says "diabetes" to see all her diabetic recipes. We're in a similar situation: my partner was diagnosed a few months ago. It really helped us to go to the local Diabetes Learning Center and talk to the diabetes educators there; if your doctor doesn't suggest it, you might talk to him or her about whether it's a good idea for you. Good luck to you! The whole thing is a bit overwhelming at first, but you'll figure it out! Hi – another great resource is The Best Life. I worked on the Best Life Diabetes book (http://www.amazon.com/Best-Guide-Managing-Diabetes-Pre-Diabetes/dp/B0052HKQ78/ref=sr_1_1?ie=UTF8&qid=1350141666&sr=8-1&keywords=best+life+diabetes) and it is super helpful. And for some inspiration, check out Michelle's success story! I've worked with Michelle for years and she is awesome!